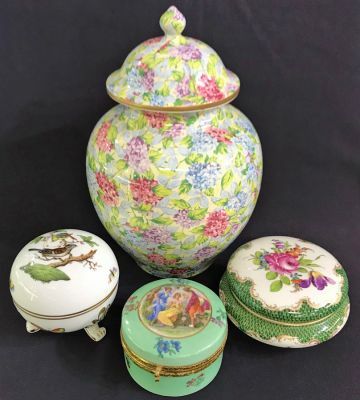 Chintz ginger jar by James Kent in the Hydrangea pattern. Herend porcelain box in the Rothschild Bird pattern. 3 3/4” diameter, 3 1/2” high. Hinged porcelain dresser box, German, circa 1900. 3 1/2” diameter, 2 1/4” high. Porcelain dresser jar, marked with the “SP Dresden” trademark registered in 1901. (Saxonian Porcelain Factory, Dresden). Made for Ryrie Brothers, Toronto, circa 1910. 4 3/4” diameter, 2 1/2” high.